The 1967 Leyland Titan was one of the last buses to be built with a traditional open rear platform. 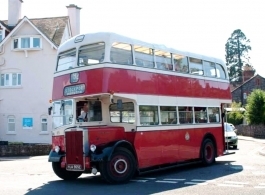 With seating for up to 64 passengers, this Red and Cream double deck bus is great for large wedding parties as it is able to transport all guests to and from the wedding venue at the same time in a unique and fun environment. Should you need additional buses we can also organise other vintage buses including single deck models of a similar colour scheme.